We’re back on the road this Saturday to Hull for the tea time kick-off. It’s a ground I do enjoy going to and the city centre is worth a visit if you can find the time. Plenty of great little boozers. A couple of us found ourselves there mid- afternoon for the Tuesday night game back in 2015/16 and set off on an impromptu crawl. We always seem to take a decent following and make a fair bit of noise, plus we have a knack of putting in a decent performance too. It was the aforementioned midweek game at Hull where a seed was planted about how a relatively small group can drive the atmosphere. A few Forest fans, quite by chance, huddled together and made a difference that night. What would perhaps have been a fairly typical mundane evening actually became a really enjoyable night with some brilliant support from the 1,000 Forest fans that had travelled. We’ll get more of the same this Saturday hopefully. We’ll be travelling up in car from Nottingham in the early afternoon. The shift back for Sky will inevitably dent the numbers as will the lack of concession tickets available but hopefully a decent number will be in attendance to back the Reds. 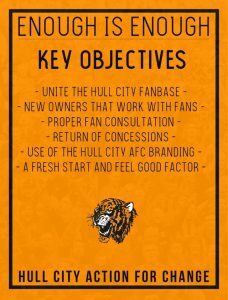 You’ll be familiar with the Hull Tigers name change fiasco which thankfully ended in failure but that did not end the frustration for Hull supporters. Mike of the Action for Change movement points to ‘severe asset stripping’; the removal of concessionary prices and the closing down of a community sports facility to transform it into a training facility that still remains unused. Needless to say they also find themselves back in the Championship after a single season back in the Premier League. What the group are looking for is support. Not only from their own fans but also from Forest supporters to join them in their ‘Day of Action’ this Saturday. Although the title sounds feisty, Action for Change intend for this to be more of a community event with live music and a tribute to former player Les Mutrie. The gathering will conclude with a mass fan walk to the ground. While their objectives ultimately involve the removal of the owner they also want to ensure a positive atmosphere for the team and a united fanbase; issues that we at FG faced ourselves last season. The venue will be the William Gemmell Club which is in close proximity to KCOM Stadium and the event will begin at 2:30pm. They have asked whether we are able to attend and that invitation extends to all Forest fans who wish to go along. While the scars of our own previous owner are still fresh and the recovery process will be long we can at least console ourselves that the previous regime ended over the summer. Hopefully Hull City can find a similar solution. You can read more at @HCAction4Change on Twitter or Facebook.